It's tempting, especially when parenthood is brand-new, to jump at every beautifully designed kids' toy you see. Then, after a few months (or, uh, years…), you realize that your son hasn't touched that gorgeous recycled-wood horse since the day it was unwrapped, and that what you have here is a very small piece of shelf art—and a present you bought, as it turns out, for yourself. And hey, that's fine. But we do want to get toys and games our children actually enjoy, too—and yet, it would be nice if they weren't all Lightning McQueen-themed, wouldn't it? That's where Blue Orange Games comes in. For years now, the company has been making board games with lovely design and craftsmanship that are also a lot of fun to play. 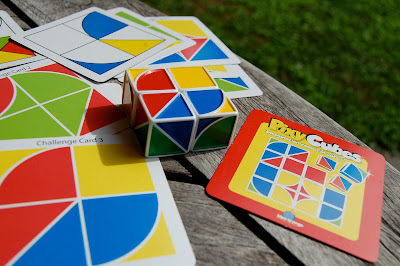 Most of them to this point—like most really good board games, period—have been for older kids, tweens at the youngest. But its latest, which is not, in fact, a board game, is happily for ages six and up. There's a developmental/educational aspect here as well, of course—Pixy Cubes are aimed at helping with young kids' color and shape recognition, and, obviously, memory skills and creativity. But those feel more like side effects than the main agenda. And since Blue Orange wisely made the cubes not merely attractive and fun, but also small, light, and extremely portable (not to mention quite reasonably priced at $16), Pixy Cubes are really a perfect travel game, too. Well, it's time for me to rave about another New York Review Children's Collection release, as I do pretty much every time one comes out. 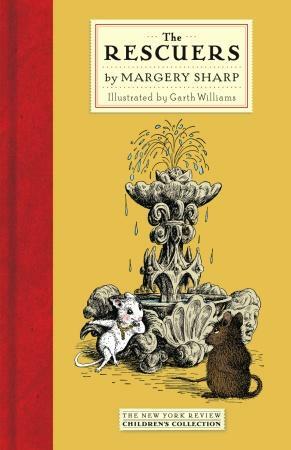 To recap for the uninitiated: This imprint finds great out-of-print classics of children's literature, and then reissues them in beautifully designed (and suitably old-timey-feeling) hardcover editions. I find I cannot say enough good things about the NYRCC. My latest song of praise concerns The Rescuers, written by Margery Sharp in the late 1950s (and, in the late 1970s, adapted into a Disney film). An adventure story about three unlikely mice companions who endeavor to free a (human) poet from a fearsome prison, it's written in a style that will be familiar to anyone who's read other children's writers of the same period (E. B. White, say). Well-paced and charming (despite an occasional rather arbitrary reflection of typical 1950s sexism), the book is well-suited to entertain a new generation of young readers. This is especially true because the evocative illustrations are by one of the masters of the time, Garth Williams, who is responsible for an absurd number of the images associated with the period's classic characters, from Wilbur and Charlotte to Stuart Little to Chester Cricket and Tucker Mouse. He's in equally fine form with The Rescuers (couldn't Disney have gotten him to do the animation for the film? ), managing to get a remarkable amount of humor and expression into the faces of his mice protagonists Miss Bianca, Nils, and Bernard. As is so often the case with NYRCC reissues, it's sort of hard to believe this book went out of print in the first place, in fact. (I suppose that's a reflection of where the book industry stands these days.) But the silver lining is that we can now own these books in the imprint's handsome hardcovers. As always, I'm waiting eagerly to see what the next one will be. When I heard that Mick Cooke of Scottish band Belle and Sebastian had a children's album out, I was expecting something a little different, sure. Somehow, though, I wasn't prepared for just how eccentric it turned out to be—or, to be honest, how much fun. 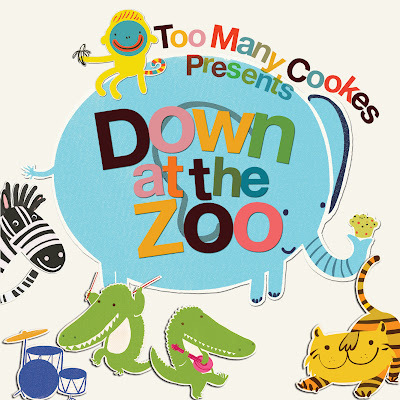 Down at the Zoo emerged from what's now the album's last track, the infectious "The Monkeys Are Breaking Out the Zoo." Belle and Sebastian recorded that song for Colours Are Brighter, a 2006 charitable children's album that Cooke himself put together featuring many prominent pop artists; the response was strong enough that Cooke started writing some other zoo-centric songs for kids, which he's now released under the name Too Many Cookes. The lyrics are simple and basic enough for the very youngest children, but the pleasant and constant randomness (the pachyderms who've eaten too many buns in "The Elephants Are Feeling Sick," the penguins who enjoy playing horns and wind instruments in "Playtime for the Penguins") had my six-year-old giggling in no time as well. And the upbeat tunes follow suit. They do contain much of the complexity one might expect from a Belle and Sebastian member (more than one, actually, since several pitched in here), including some marvelous horn arrangements. But they're also a throwback to earlier and simpler styles of kids' music than you tend to hear nowadays. It all ends up feeling something like a children's-music rock opera—as if Tommy had been made child-appropriate and then performed by the Muppets. 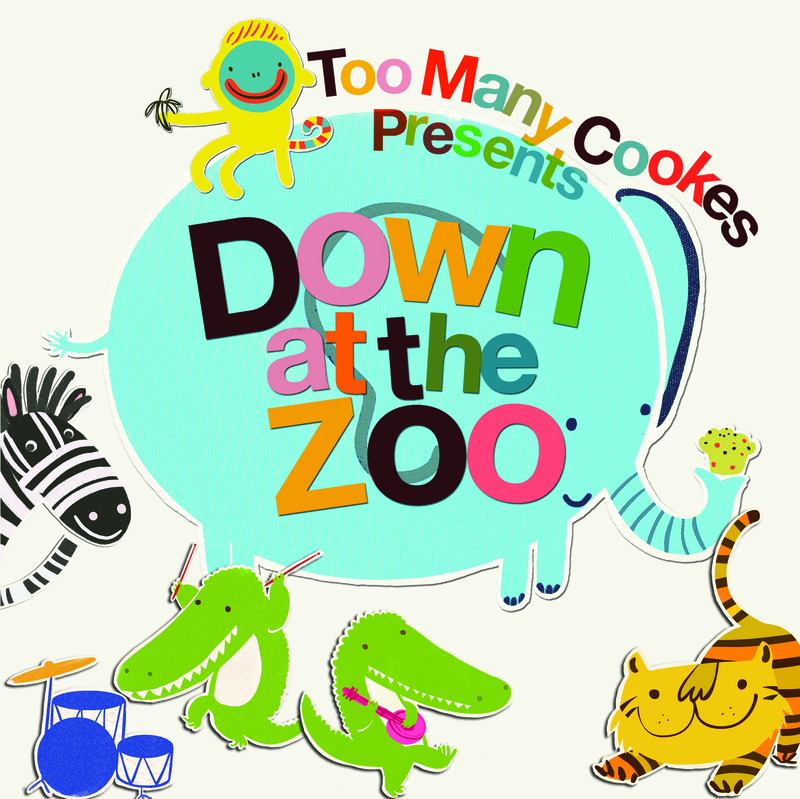 That sounds ridiculous, I know, but also like it could be a lot of fun—and that's what Down at the Zoo is like. I can certainly attest that kids love it almost instantly, if my boys are any indication, but parents will find themselves smiling at these songs—both bemusedly and joyfully—as well. Whenever possible, we prefer to go grocery-shopping without the kids. Yes, some children are calm, patient, and helpful in the supermarket, or so I've heard, but neither of our sons fall into that category, and when they're along we can count on endless distractions and variants of "No, we're not buying that!" 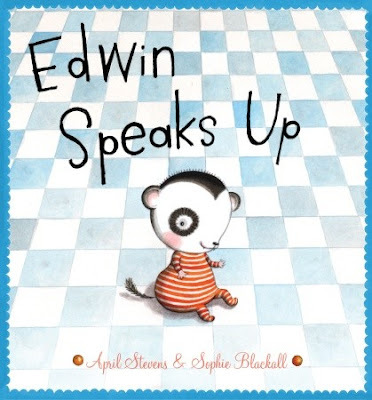 So April Stevens's Edwin Speaks Up, in which a harried mother ferret attempts to get her shopping done with her five young kids in tow, really spoke to us. Mrs. Finnemore, it must be said, reacts somewhat more calmly than I would in similar circumstances without large doses of Xanax, but the squabbles among her kids and their pleas for chocolate take their toll in another way: She keeps forgetting where she put things—her car keys, her pocketbook, even her shopping cart itself. Luckily, her youngest child, Edwin, is one of those helpful children I mentioned before. Less luckily, he isn't quite talking yet, though if Mommy listened a little more carefully she might be able to heed his timely and sensible warnings. For example, when she can't find that pocketbook, having left it on the roof of the car while puttng Edwin in his carseat, he says, "Frigle dee ROOFY plowck"—but a fellow shopper in the parking lot has to point out to Mrs. Finnemore where it is. Edwin continues to be the garbled voice of reason throughout the trip, watching Mommy go by with the wrong cart (he's in the right one) with a glum "Gloody pooper do no LEAVEY," and finally taking matters into his own hands when his mother is about to check out without the main thing they came for. Now, do you think there's a chance his enjoyment of the book will make Griff behave more like Edwin on our next shopping trip? There's an alternate way to get a similar feeling, though: the subgenre of new children's books that I'd term nostalgic. These books reproduce the feel, in illustrations or storyline or overall writing style or all of the above, of classic children's lit of a bygone age. They need to be well executed, of course—the kids who are still, after all, their primary audience won't be interested in the slightest if they're not—but when they are, they get into special territory: magical to parents and children alike. Kids—yes, particularly girls, but not solely—of the voracious-reader variety who are between 8 and 12 or so will adore these books. And their parents—again, not just moms—will get a nice faux-nostalgia kick at the same time. When you see a lot of children's picture books on a daily basis, there's a danger of forgetting the old warning about books and their covers: You start to think you can tell almost at a glance whether a given book is going to be interesting or not. Hubris comes easily. In most cases, the feeling is more or less justified, too. Most of the standouts of the genre are at least partially illustration-driven, and you can indeed tell right away, in most cases, when you're dealing with something extraordinary in that regard. But then comes the book that serves as your comeuppance, the notice that you're not the at-a-glance expert you thought you were. For me, that book is actually a best-selling series: Judy Schachner's Skippyjon Jones books, which I first came across back in my Cookie magazine days. They were already wildly successful even then, but the first one I came across looked like a lot of other mildly interesting anthropomorphized-animal picture books out at the time, and didn't stand out all that much even after a quick read. I didn't really get it; with a shrug, I put it aside. My older son eventually came across the series and immediately adored it, and a few bedtime readings later I belatedly saw why. Skippyjon is a Siamese kitten with big ears who likes to imagine he's a Chihuahua, with a group of imaginary Chihuahua friends, Los Chimichangos, with whom he goes on adventures. And the tales about him, which I initially found just mildly amusing and even a little silly, are in fact surprisingly interesting explorations of a family's acceptance and encouragement of a child's vivid imagination. Schachner's rhymes are subtly clever, and the storylines themselves, especially Skippyjon's relationship with his mother, are endearing. 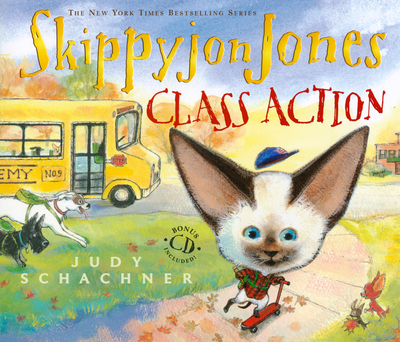 The latest entry in the series, Skippyjon Jones, Class Action, which deals with its protagonist's desire to go to school (which his mother sensibly notes is something dogs, not cats, do), is a worthy addition. All that said, another issue turned up as I got to know the series better, one that's a subject of conversation on many a blog out there right now. Skippyjon uses "his best Spanish accent," as the first book puts it, when he's on his Chihuahua adventures, and many of the books' rhymes rely on adding "-o" to the ends of all sorts of words. To borrow a catchphrase from Daniel Tosh, is it racist? There's no question of anything demeaning or ugly-stereotypical about anything Skippyjon and his pals do, and the books are if anything a celebration of the Chihuahua persona, so ultimately I'd say not really. But I did have pangs of doubt when reading the book aloud for the first time, and I can certainly see how a children's book series centered around a Taco Bell chihuahua accent might be considered offensive. (Bloggers and commenters of Latino background seem to come down on both sides of the matter, from what I've been reading.) Certainly, thought-experiment parallels with other ethnicities and dialects quickly move into extremely hot water. At any rate, the whole episode has been a reminder that a whole lot more can lie below the surface than is immediately apparent in children's books. I really can't judge them by those covers. I like words. A lot. Heck, I have to fight verbosity in my own writing. So why is it that so many of my favorite children's books of the last few years are wordless, or nearly wordless, picture books? And why does every single one of these I come across turn out to be so good? I have theories—only the best, most accomplished author-illustrators even attempt the challenge, or are allowed to attempt it by their publishers?—but no answers. 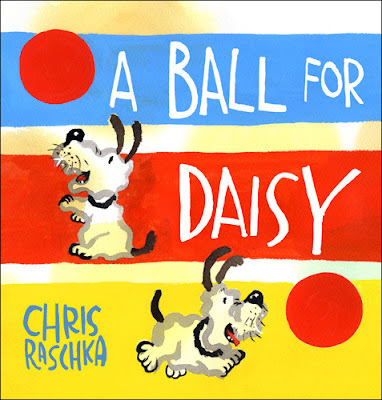 The latest is A Ball for Daisy, by Chris Raschka, who certainly fits into my “most accomplished” theory. He's been responsible for several of our family's most treasured children's books already, and his sparing use of words or even mere sounds has always been a trademark, from the Caldecott Honor winner Yo! Yes? to the concentrated encapsulation of jazz Charlie Parker Played Be Bop. 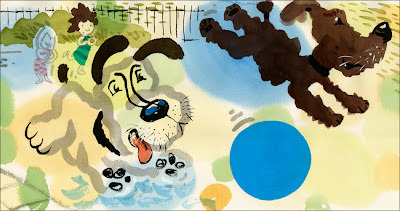 A Ball for Daisy is about a happy little dog and her beloved red ball. The first portion of the book shows us her pure joy in it as she bats it around, bounces it, even cuddles up to sleep with it. But on a playdate with another dog outside, tragedy strikes—the other dog runs off with it, and as she chases after to get it back, the ball is punctured and destroyed. Daisy is devastated, until her little-girl owner and her friend, the owner of the second dog, come up with a solution. It's a very simple story, serving up a gentle but effective message of sympathy to kids who've lost a treasured toy themselves on the side. The reason it's so wonderful, of course, is the illustrations themselves; Raschka is marvelous at capturing every doggie emotion, from manic upbeat energy to big-eyed sadness and disappointment to overwhelmed gratitude and final satisfaction. This may not be one of those visually stunning wordless books—it isn't trying to blow you away with the sheer gorgeousness of the art, as many do—but it's a great example of how good storytelling doesn't always require words at all. And it's a sure bet for any young child who has a doggie herself—not to mention a guaranteed smile for her parents. So we also leaned heavily on music, both the kids' variety (a lot of Recess Monkey, natch) and not (we had the Civil Wars' Barton Hollow on heavy rotation, the title track in particular). But this was also the first long car ride we've embarked on during which everyone in the vehicle is old enough to participate in traditional passing-the-time games, like I Spy, the Alphabet Game, and 20 Questions. And they were a big hit—especially the latter, which we at first thought was a little over Griff's head (he had a tendency to repeat the same question after it had been answered, always with strangely perfect comic timing) until one of his supposedly random guesses ("Is it a camper?") was exactly right. Now, it's no news to anyone that these kinds of games are fun for family car rides, I know; there's a reason they've survived as long as they have. And God knows that sometimes parents need something, anything, to keep the "Are we there yet" refrain at bay. (Seriously, that phrase must be an innate developmental human trait, like standing upright, because both our sons started using it almost before they could say anything else.) But in our age of endless distractions and stimuli, it was a nice reminder to me, at least, that simplicity is not only still possible—sometimes it's more fun, too. I think even Dash would agree. The Clockwork Three, by Matthew Kirby. Three separate plotlines involving three children—an orphan street violinist, an apprentice clockmaker, and a hotel maid—are slowly woven together in this adventure mystery (the author's debut). As it turns out, each one has part of the answer to the puzzle one of the others is trying to solve, and they must learn to work together to deal with very real dangers. Elizabeth's take: A great mystery, this book has many twists and turns, in addition to interesting characters. Once you start, you can't put it down. 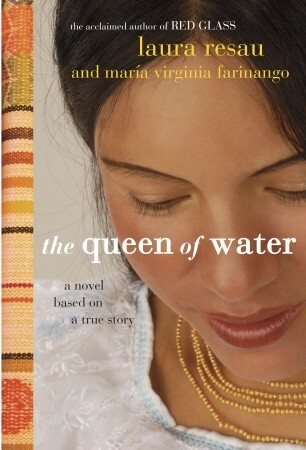 The Queen of Water, by Laura Resau and María Virginia Farinango. This novel, based on a true story, tells of Virginia, a seven-year-old Andean girl in Ecuador who is sent by her desperately poor parents to be the servant in a wealthier mestizo household. It's rather like something out of a Dickens novel—she is beaten, and promises to send her to school are broken—but she educates herself nonetheless in secret, and in the meantime becomes accustomed to a very different way of life from the one she'd known. Then, at age 12, Virginia has the chance to return to her parents...and finds herself ambivalent. This is a powerful caught-between-cultures tale. Elizabeth's take: This book is touching and inspiring. It's written so well that it's almost hard to believe it's a true story. I really enjoyed it and would recommend it to anyone. 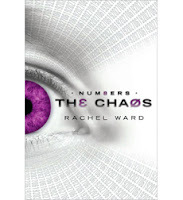 The Chaos, by Rachel Ward. You didn't think we were going to get out of a teen-novel roundup in 2011 without an dystopic novel, did you? The second book in Ward's (and no, she's not that one, though she is also British) Numbers series is set 10 years after the first one, in 2026, and follows young Adam, who has inherited his mother's curse from the first book: When he looks into someone's eyes, he can see the date of their eventual death. When he notices that an awful lot of the strangers' deaths he can't help but encounter are on the same date in the future—New Year's Day 2027—he realizes that he has to try to find out what this apocalyptic event is and try to stop it. Even on just her second book, Ward writes crackling suspense and dialogue, making for a real page-turner. Elizabeth's take: This book is told from an interesting perspective: a boy who doesn't use proper grammar. And you can follow the plot without having read the first novel, Numbers. I'd recommend it to those who enjoy science fiction or apocalyptic stories. 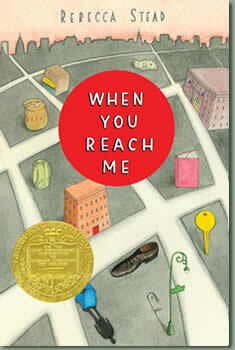 When You Reach Me, by Rebecca Stead. This is cheating a little—it's the paperback edition of this winner of the Newbery Medal and many other awards, and even it came out several months ago—but we missed it in hardcover, and Elizabeth was so enthusiastic that I couldn't leave it out. It's a tightly written (and fairly short, as these novels go) story about Miranda, a 1979 New York City sixth-grader whose world starts to unravel after she has a falling out with her best friend, Sal, and then starts getting mysterious anonymous notes about an upcoming tragedy she must try to prevent. Presented in Miranda's pitch-perfect first-person voice, and referring directly and indirectly to many of the classic novels sixth-graders of the 1970s and '80s would have been reading (A Wrinkle in Time, Harriet the Spy), it's pretty much an instant classic in its own right. Elizabeth's take: I could not put this short but eventful novel down! It has that quality that makes you think, "Well, maybe just another few pages...or chapters...." The characters are believable and easy to relate to. All in all, worthy of the Newbery on its cover.